Community School senior Hannah Dies and Boise High School sophomore Maddy Watts were two of 14 players chosen for the 2013 Girls’ Idaho High School All-State Soccer Team by the Idaho High School Soccer Coaches Association. Dies and Watts, both raised in the Wood River Valley, were prominent members of the All-State teams dominated by State 5A boys’ and girls’ team cham-pion Boise High School and its “Coaches of the Year” Mike Darrow (boys) and Chris Siegenthaler (girls). The only small-school player chosen for All-State for a sec-ond straight year, Dies (34 goals as a senior) ended her four-year Community School career with a school-record 105 goals in-cluding 15 hat tricks. She scored in 51 of 78 varsity games and sparked coach Kelly Feld-man’s Cutthroats to two straight State 3A tournament runner-up finishes. Before leaving the valley to attend school in Boise, Watts led the Sawtooth United F.C. U-14 girls to the 2011 Canyon Rim Classic tournament champion-ship in Twin Falls. The Boise girls (18-2-1) de-feated Centennial 1-0 in the State 5A tournament title game Oct. 26 for Siegenthaler’s sixth state championship. The Boise boys (18-1-2) drubbed Centen-nial 4-0 in the final for the Braves’ fourth state crown. Boise High placed nine boys and girls on the All-State team out of 27 selections made by the Meridian-based IHSSCA. 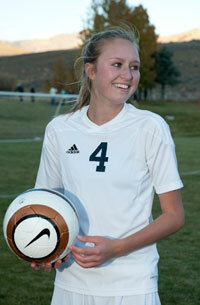 Player of the Year—Raimee Scherle, Rocky Mountain sophomore forward. Forwards—Rikki Fix, Boise senior; Allegra Weeks, Timber-line junior; Emma Bailey, Ea-gle freshman; and Hannah Dies, Community School sen-ior. Midfielders—Maggie Saras, Timberline senior; Akina Fu-jimoto, Mountain View senior; Maddy Watts, Boise sopho-more; and Hailey Boyd, Boise senior. Defenders—Jenna Clubb, Timberline senior; Calle Belo-doff, Boise senior; Sarah Toney, Rocky Mountain senior; and Hailey Woods, Meridian senior. Coach of the Year—Chris Siegenthaler, Boise High School. Player of the Year—Tyson Fox, Rocky Mountain senior. Forwards—Timmy Mueller, Post Falls senior; Carter Perry, Boise senior; and Garrett Hardesty, Boise senior. Midfielders—Robert Madril, Centennial junior; Tyler Smith, Eagle senior; Brett Becia, Capi-tal junior; and Ryan Miles, Madison senior. Defenders—Richard Ridlon, Boise senior; Eric Bambic, Timberline sophomore; Jaeden Stevens, Centennial senior; and Reagan Phillips, Boise junior. Coach of the Year—Mike Darrow, Boise High School.